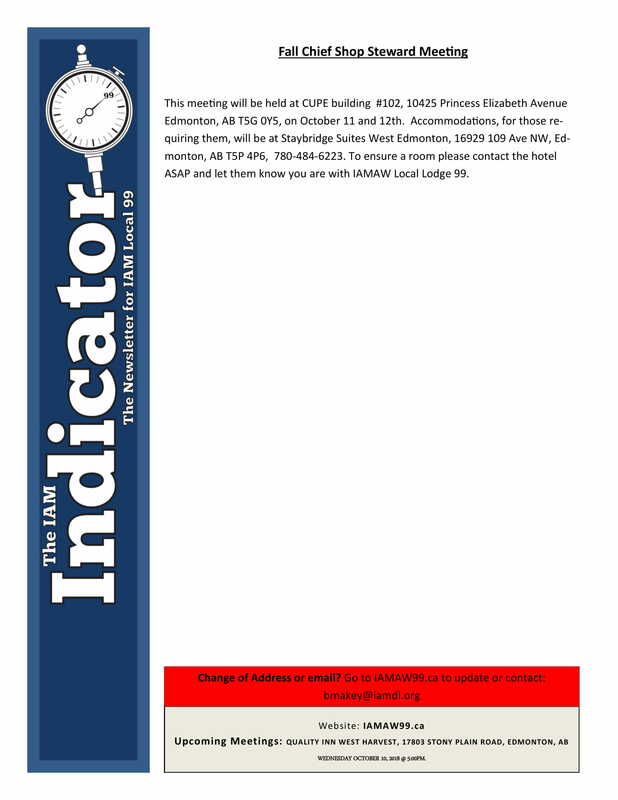 Posted in Communications, General Information, Local Lodge 99, Union Elections on September 19, 2018 by Bruce Caravan. "To our Finning members in the Fort McMurray region. The Union is gathering information to support a grievance on the issue of Finning adding the 'random' component to their Drug and Alcohol testing policy. Currently, Suncor and their supporters recently received a ruling at the Alberta Court of Appeal to return the matter in front of an Arbitrator to adjudicate. Suncor is not waiting for the Arbitrator to rule and has announced the implementation of the 'random' aspect of testing on December 1st. Currently in Canada, this is a violation of your rights and freedoms. However, until there is a decision our members must obey and grieve later so for those working on Suncor sites please be aware that you may be randomly selected and the results may have consequences. The Union will deal with those but only when the matter has been decided in the Courts or by an Arbitrator. Keep in touch with your Stewards for more information to follow when it becomes available." Posted in Finning Updates, Local Lodge 99 on November 20, 2017 by Bruce Caravan. The sheet of ballots were supposed to be sliced horizontally between each of the three ballots. Had this been done, the instructions would have been correct. If anyone has this situation, please mark the second ballot sheet with "spoiled" across the ballots and return it with the properly filled out ballot sheet. The executive needs to track the number of instances of double stuffed envelopes. The ballot sheet goes into the white envelope and that envelope goes into the self addressed and stamped envelope. This package needs to be in the mail and to the Union office by Dec 12. In addition, there have been two candidates who have removed their names from the ballot after the ballots were mailed: James Lesoway and Dennis Callihoo are no longer in the election. Morgan Eisthen is therefore awarded the position of Conductor Sentinel by acclaimation. Posted in Local Lodge 99, Union Elections on November 2, 2017 by Bruce Caravan. Once again, Local 99 is providing 2 $999.00 scholarships to members, their spouses, or their immediate family (children, stepchildren or adopted children). Send an email with the relevant contact information, proof of enrollment in a post-secondary course and a transcript to scholarship@iamaw99.ca prior to Dec 13, 2017. The winners will be selected based on transcripts by LL99's Executive. The IAM international is also providing a scholarship that our members and their immediate family (Children, stepchildren or adopted children) can apply for. This application must be postmarked no later than February 23, 2018. 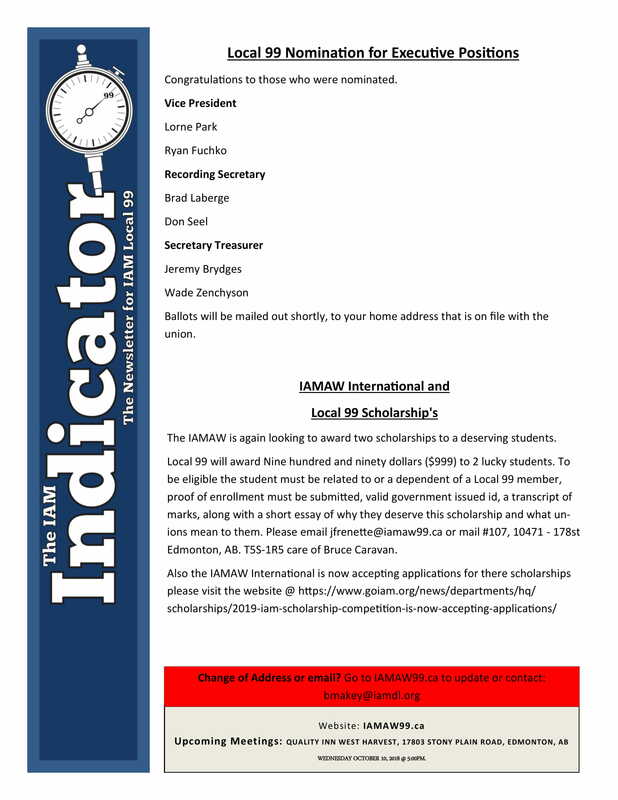 Click on the information below to go to the IAM scholarship page. Posted in Local Lodge 99 on October 11, 2017 by Bruce Caravan.